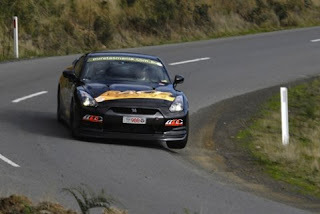 Tony Quinn is tied for first place with Kevin Weeks in a Lamborghini at Targa Tasmania after the 2nd day of competition. The battle for victory in Targa Tasmania is hotting up with the day one leader, Tony Quinn, now sharing the top spot with South Australian Kevin Weeks in a Lamborghini. Eight-time winner, Jim Richards, is just one second further back in third place after a day that really saw the cream rise to the top. In the classic competition Ben Wooster, driving the 1990 Nissan Skyline GTS, is coming under increasing pressure from two-time winner, Rex Broadbent, with Bill Pye not far behind in a similar 1974 Porsche 911. The Rookie Rallye for modern cars, which concluded today, was taken out by the Nissan Skyline GTR of Andrew Richmond, while Boat Harbour’s Phil House won the classic section in his BMW Alpina.